Burrata. Even the name sounds lovely rolled around the tongue, when said with an Italian accent. Rolling this creamy cheese speciality from Southern Italy (Puglia) around your tongue is even better. Best not to think about the calories though . 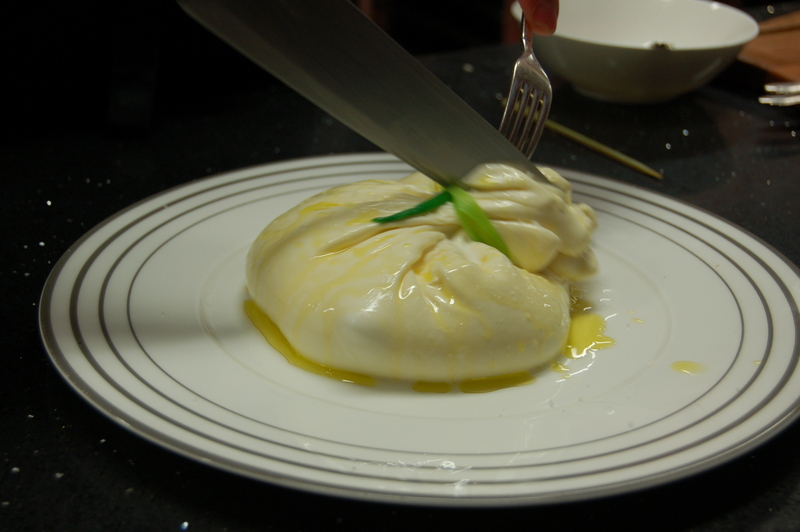 . .
My first burrata experience was a few years ago at Ribello, a smart Italian restaurant in La Lonja, Palma. Along with the editor of abcMallorca magazine and a photographer, we were trying the place for a restaurant review I was to write. Last week I ate the best burrata I’ve ever tried – standing in the gleaming kitchen of Zaranda, one of the two restaurants at the rural five-star Castell Son Claret hotel near Es Capdellà. It wasn’t just the flavour, creaminess and texture that made it so special: it was the fact that it was made right in front of my eyes. Fernando Pérez Arellano is the culinary genius behind Michelin-starred Zaranda – the restaurant he originally opened in Madrid, before moving pots, pans and personnel to Mallorca. Since April 2013 he’s had a British chef as his assistant. Originally from Moseley, in Birmingham (UK), 25-year-old Claire Hutchings was one of three finalists (and the youngest and only female) in the 2011 series of MasterChef: The Professionals in the UK. Her inventive cuisine had The Boss and me salivating every episode and we wanted her to win. It didn’t happen, but she’s certainly onto a winner working at Zaranda. One of the tasks Fernando gave her was to develop a recipe and process for making burrata. A lot of work went into sourcing the best milk for the process: they found it in Valldemossa, from a herd of Menorcan breed cows. Considerable development work goes into new dishes and culinary processes in Zaranda’s kitchen, but it’s paid off: their homemade burrata is now on the menu in both Zaranda and Olivera (the hotel’s other restaurant). Paired with some of the moreish bread from the hotel’s own in-house bakery, it’s the food of the gods. Removing the curds from the whey. A team effort by Fernando and Claire. Claire Hutchings at work in Zaranda’s kitchen. Starting to prepare the strings, known in Italian as ‘pasta filata’. The burrata is tied, like a gorgeous parcel – just waiting to be opened.